It’s showtime—and this late-summer bloomer is as showy a flower as they come! 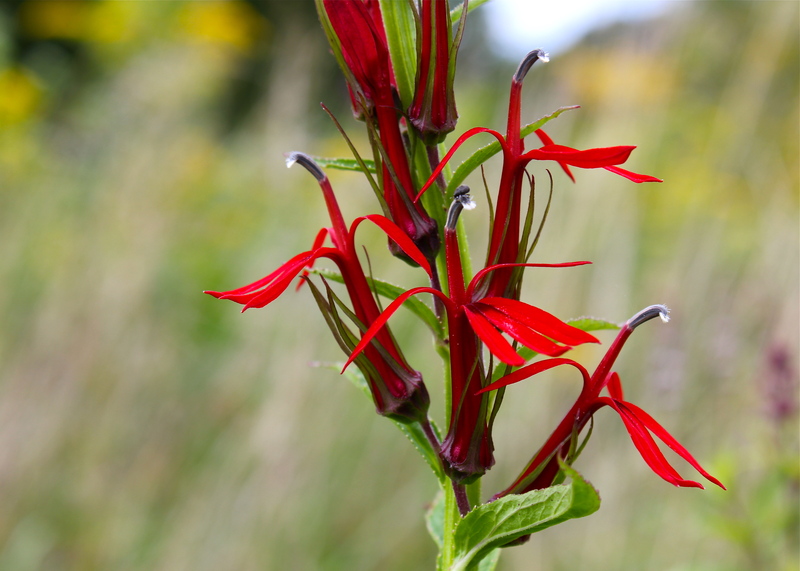 Cardinal flower, a native perennial, produces bright red flowers on tall, unbranched stems. The flowers are produced on a raceme, which opens from the bottom first. Each individual flower is bright red and tubular, with 5 deep lobes that are obvious on first inspection. The reproductive organs of the flower are clustered into a grayish head at the top of the tube. Similar to great blue lobelia, the lower petal of each flower forms a 3-lobed lip at the entrance to the flower. The overall effect of the shape of the flower is that of a flying bird. Lovely! The stems are unbranched and grow up to a meter tall. The leaves are lance-shaped with serrated margins; leaves vary in size up to 6 inches long. Cardinal flower grows in sun to part-shade. It prefers wet places, like streambanks and soggy ditches along the sides of roads. Hummingbirds are attracted to the bright red color of these flowers and consequently are important pollinators. The flowers are also visited by butterflies, especially swallowtails. Historically, the plant gets its name from the color of the vestments of Catholic cardinals. As a medicinal plant, teas were made from the roots and leaves, and then used to treat respiratory and intestinal disorders. As a wildlife food, mammals generally avoid eating cardinal flower because it produces a milky, white latex that is toxic. See the gallery below for photos taken in August, in Montgomery and Giles Counties in VIrginia. Very nice. One of my favorite wildflowers.